Anti-sagging, anti-age spots. Enriched with Soya peptides + melanin-block. For mature skin. Dermatologically tested. 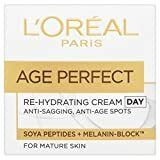 L’Oreal Paris Age Perfect Re-Hydrating Day Cream, a source of intense hydration for mature and menopausal skin. 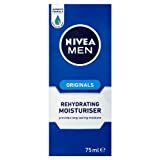 The luxurious moisturiser, enriched with Soya Peptides and UV filters, helps to firm facial contours to fight against skin sagging and to reduce the appearance of age spots. Skin feels hydrated, smoother and more comfortable. From Science to Beauty With more than 30 years of dedicated research, at L’Oréal Paris we know your skin inside out – whether normal, dry, dull, ageing or combination. Our skincare creams are developed and rigorously tested with leading skin experts and scientists worldwide. Proven science, cutting-edge innovations captured in luxurious textures for a sumptuous skincare experience. For beautiful skin today and more youthful looking skin tomorrow.